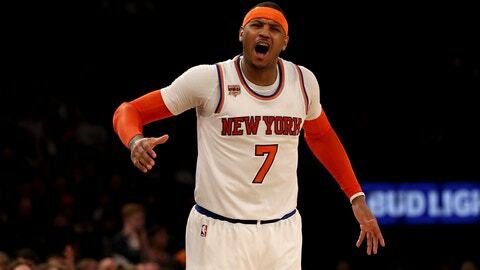 New York Knicks star Carmelo Anthony will replace injured Cleveland Cavaliers forward Kevin Love on the NBA All-Star East team, according to ESPN's Marc Stein. Love is slated to miss the next six weeks after undergoing arthroscopic knee surgery on Tuesday. Anthony reportedly accepted the invite on Wednesday. Anthony missed the All-Star team roster for the first 2009. Anthony finished eighth among Eastern Conference frontcourt players in voting by fans, media and players. He previously started all seven of his previous All-Star Games and once delayed knee surgery to play in the game.